The terraces of Kitabi were built in 1991. However, as a result of the events of 1994, when the sisters were exiled, this infrastructure was damaged, the erosion by rain is considered as one of the most important factors of damage of the soil, hitting the most fertile layer, which has a direct impact on the environment and on agricultural production. The damage to arable land. The destruction of food crops and infrastructure (bridges, roads). The loss of lifes, of animals and of material. The change of the physico-chemical properties of the soil. Starvation and the lack of potable water. The exile of the population. The trauma of a few individuals. The aim of this project is to restore the infrastructure and the anti-erosion features of the bottoms of hills in the cell Kagano of the sector KITABI to resolve in a sustainable manner the above-mentioned problems. 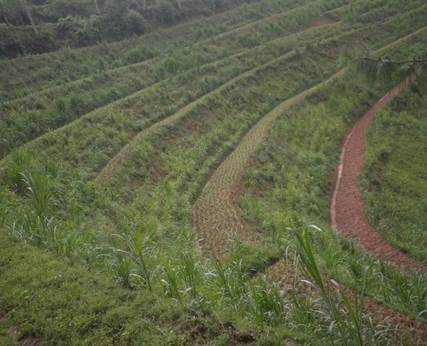 The general objective of this project is to restore the fertility of the soil by the fight against anti-erosion and the rehabilitation of terraces of two adjacent basins of 2 ha in the village of Uwintyabire. This action would like to contribute to the creation of favorable conditions for the growth of agricultural production and of animals through the works for the protection of the two water catchment areas. 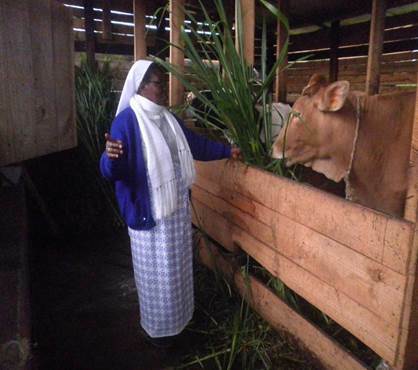 The project will be carried out by the sisters St Francis of Assisi in cooperation with the agriculture engineer and the local people who will be involved in the project. The tasks of supervision are assigned to the agriculture engineer. The tasks of monitoring and evaluation will be performed by a team consisting of members of the sisters of Saint Francis of Assisi, a representative of the sponsors and executive engineer. 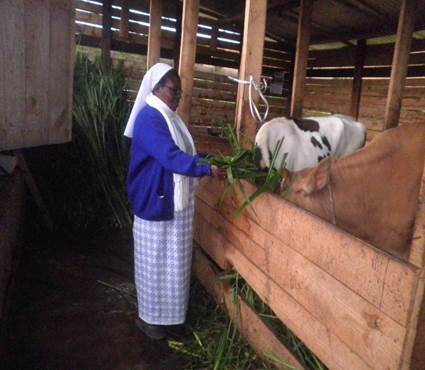 The follow-up and evaluation report will be made once per month for the duration of the project so that the sponsors and the sisters can assess the progress as well as any corrections and adjustments if necessary. To increase awareness of the population regarding the proper management of infrastructure. 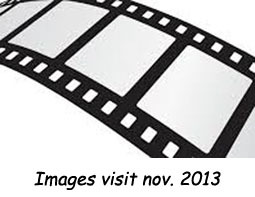 Translation mail from Eustache october 2012. Photo 2: Shows the terraces at commencement of the activities of rehabilitation of terraces. Report of two weeks of the progress of the project. We started the project on the left side coming from Kitabi on an area of at least 1ha with 1 agronomist, 1 monitor Agri, 1 team leader and two teams of 20 person each. All these work mentioned above has given us an overall idea for the progress of activities in future, which will allow us to manage the difficulties concerning the existing terraces. 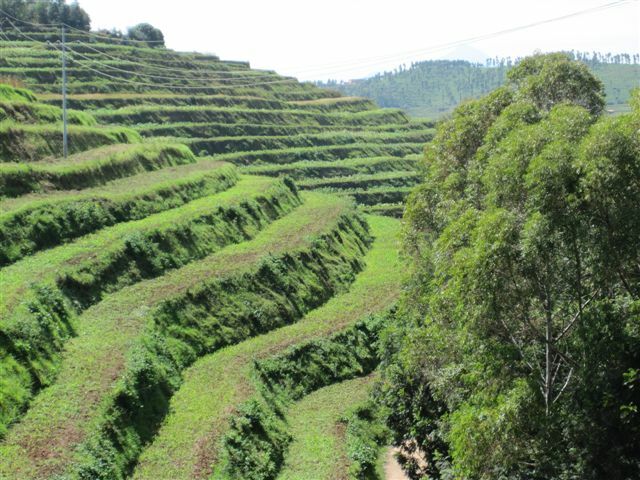 The population in the sector of Kitabi is involved and made aware of fighting erosion and the implementation of radical terraces. All participants got a technical knowledge building on soil management..
90% of the anti-erosion means were re-established, thanks to the modern technique of improved terrace shaping. The improved area covers more than 60% of the slopes. The terraces are small (1 or 2 meters) where the embankments are broader than 2 meters. 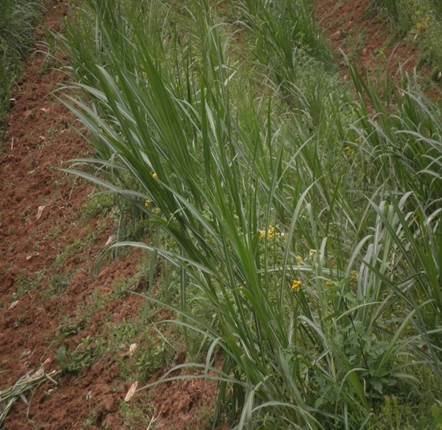 In the future there will be sufficient grasses for the cattle. 1 canal of 150m still to be digged to channel the water coming from the main road, to avoid damage on the re-established terraces. 1,5 tons travertin is remaining. This will be put after the recovery of the total surface. The growth of the potatoes is good. 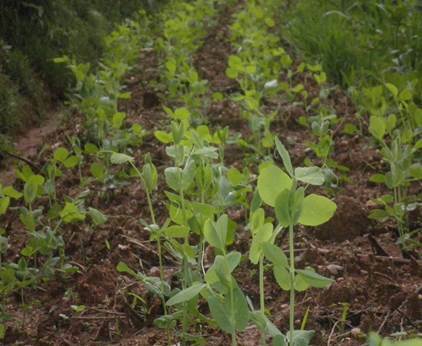 The use of organic fertilizers in combination with compost helps in the success of the project. Removal of weeds and improving the eucalyptus. 2 small vegetable gardens (for use in the kitchen) are taken care of very well. 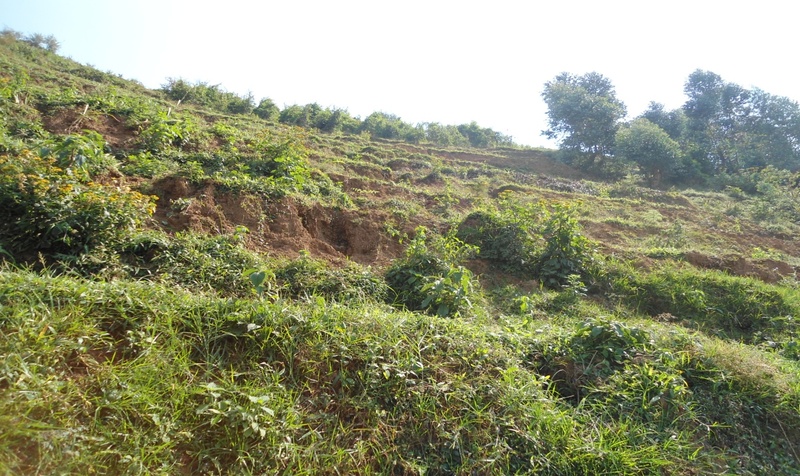 The purpose of the project is to improve the infrastructure and establish anti-erosion means for the hilly surface of the cel Kagano of sector Kitabi, to avoid/fight erosion of the terraces in a sustainable way. - Lack of daily maintenance of the activities and renovated terraces. 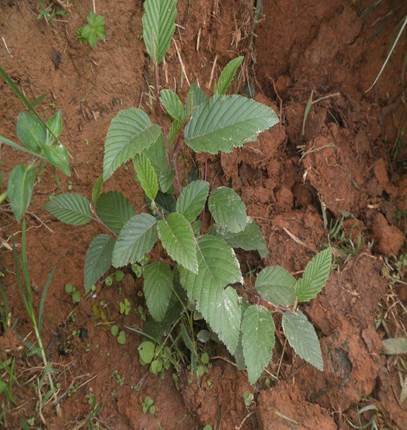 Planting of Alnus, Carriandra, Leucaena and Accacia Decaputala : 70% of the plans. We expect positive results, the roots are well fixed which will help in the protection against wind. The targets to improve the infrastructure to avoid long term problems are achieved. 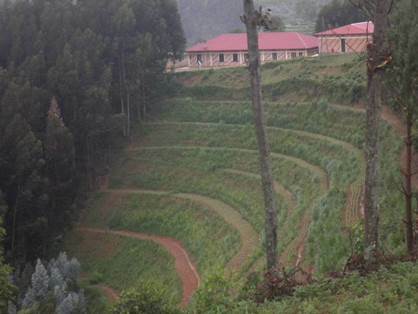 The evolution of the project is measured in line with the agricultural seasons in Rwanda. 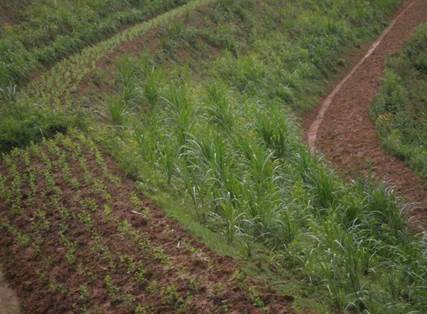 Site activities, to improve long term agriculture, are established related to protection and productivity. P.S. Season A 2013 shows an increase in the production. B 2013 shows a weaker production because of climate changes (very strong dry season) compared to the beginning of the season i.e. 2,3 ton/ha. For season A 2014 we expect a corn production of 4 ton/ha. In line with the above mentioned activities during the first month after the project start the full budget has been spend. The population is motivated about the new techniques which leads to a better result. . The land has significantly improved. No landslides occurred anymore. Plantation of trees and fixing grasses on the slopes. This will contribute in a good return of the texture and the fertility of the soil. A very high degree of productivity is reached due to the project preparations. De population could benefit from a very high yield . There were some small delays because of very much rain in March and April, followed by a long, extreme dry season. In good state and very well maintained. The terrace slopes are well maintained and covered with fixating grasses. 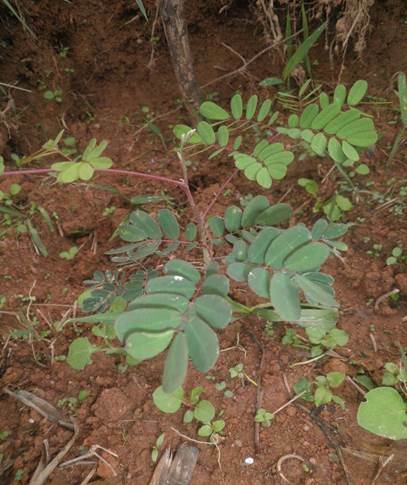 Also well growing shrubs can be seen on the pictures. 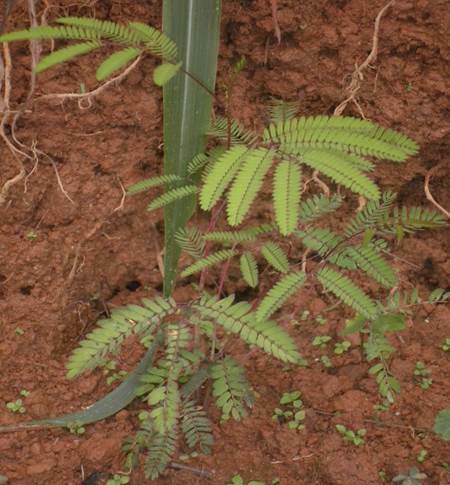 This pictures are showing several agro-forest specimens. They are going to play a role in the establishment of a biological fence around the farm, as well as for feeding the animals and to protect the slopes and to offer spots of shade.